Lionel Messi was left out and Gerard Pique watched on television with a bowl of prawns as Barcelona saved themselves for Manchester United by resting 10 players against Huesca on Saturday. Goalkeeper Marc-Andre ter Stegen was the only one to keep his place for the goalless draw at El Alcoraz as coach Ernesto Valverde prioritised progress to the Champions League semi-finals after their 1-0 first-leg win at Old Trafford in midweek. Messi was left out of the squad completely while the suspended Pique posted a picture on social media of him watching the game on television, in front of him a large bowl of seafood. The draw gives Atletico Madrid the chance to reduce the gap at the top of the table to nine points if they can beat Celta Vigo at home later on Saturday but, with six games left after this weekend, the difference is likely to prove irrelevant. 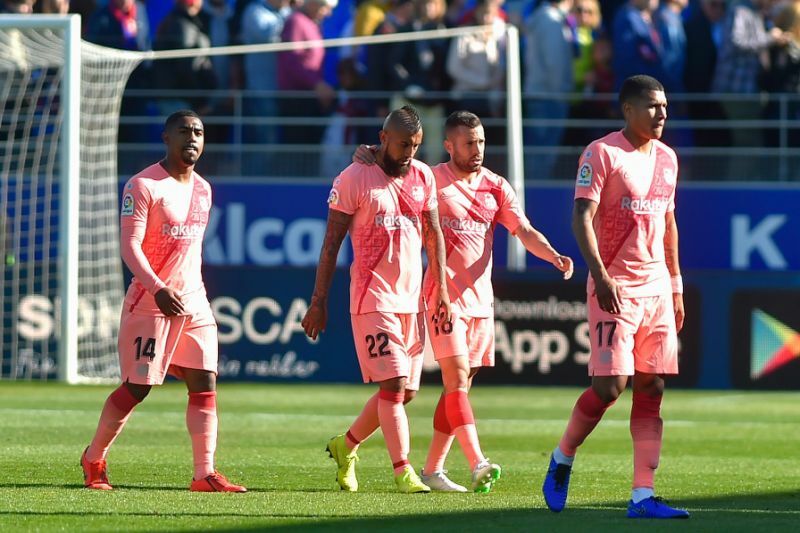 For Huesca, who are bottom of the table in their first-ever season in Spain's top flight, a hard-earned point means they sit five adrift of safety, albeit having played a game more than those immediately above them. Their survival bid remains unlikely but alive. Messi left Manchester with a swollen nose and cheek on Wednesday after a clattering challenge from Chris Smalling but there is little concern about the Argentinian being fit for the return game at Camp Nou. Barca's huge advantage at the top of La Liga has afforded them the luxury now of prioritising success in Europe, the only issue perhaps for Valverde the small matter of maintaining momentum. Like Pique, Luis Suarez was also banned while Ivan Rakitic, Sergio Busquets and Clement Lenglet were among those rested. Ousmane Dembele came in after recovering from a hamstring injury and, after playing 67 minutes, his chance of a start next week would appear enhanced. Huesca had their moments as Enric Gallego burst through but shot wide and then he wanted a penalty after Ter Stegen slid through the back of his legs to claim the ball.